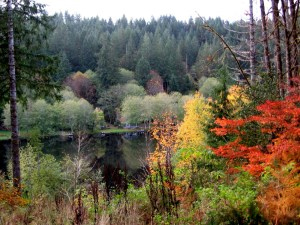 I have new clients who ask me questions about Fishhawk Lake versus other lakes in Oregon and Washington. They are searching for a place to go that’s not too far from Portland, Vancouver or the Portland airport, that will answer some of their “dreams” for a vacation home on or near a lake. So! If you are looking for a lake that is quieter, that you can kayak, sail, canoe, swim in, fish in a drift boat or use an electric motor or human power, hike around, then WE’RE THE LAKE FOR YOU!!! Now, if you are looking to water ski, jet ski, or use any kind of gas motor, uh…bye bye! The reason? 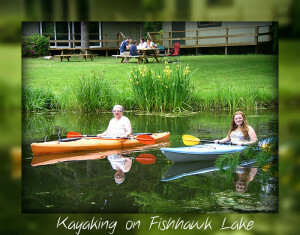 Because Fishhawk Lake is also our water source to drink, shower, use for cooking, etc. and so we don’t allow gas motors. Fishhawk Creekand four other smaller creeks feed Fishhawk Lake. We have our own water treatment plant and our own sewage plant. The Homeowner’s fees of $1,442 per year cover any/all usage of water and sewer (along with many other amenities) and each lot has it “available” even though it may not all be hooked up. 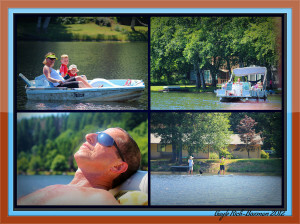 Another difference between Fishhawk Lake and other lakes in both Oregon and Washington is that you own your own land it is NOT leased. I have had several clients throughout the years who’ve done their research and found that they actually couldn’t “buy” the property they want to camp or build on. 95-year lease is common with those other lakes. You most DEFINITELY OWN your land at Fishhawk Lake whether or not it has a house on it. You can buy a lot and camp on it forever if you wanted to or build later. Once you start the building process, you have 10 months to complete it. Right now there are a lot of choices of established homes for sale on and off the lake at reasonable prices. One of the many plusses about having this kind of lake living is that it’s essentially more peaceful and quieter. It’s still a TON of fun, too! Pontoons can be fitted with small electric motors, we personally own a 22′ pontoon made by Bennington, the biggest size allowed on the lake which has a small Minnkota electric motor on it and it moves quite nicely, plus you can fit friends, family AND the dog, go out to the middle of the lake and throw out an anchor and swim, party, hook up with another boat, even pull inner tubes for the youngsters behind you….lots of variety in the watercraft department here at Fishhawk Lake. Winds kick up for some personal sailing that keeps some sailors really happy out on our 50+AC lake. Many kids will use paddle boats because they’re sturdy and don’t tip over and are good exercise. 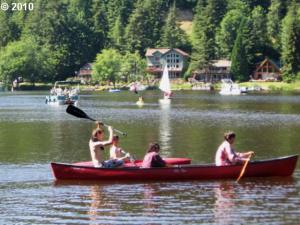 Kayaks and canoes are used by both young and old. I happened to look up from my lakefront home one day last summer just in time to see a couple of young boys tip over their canoe, but they were only in about 5′ of water and virtually stood on the lake bottom to get their bearings and eventually got back in and continued their fun. Because it was a 90+degree day, I’m sure the water felt pretty good as a welcome relief to the heat! The water depths can change from a couple of feet to about nineteen depending upon where you’re going. You can kayak clear to the end of Fishhawk Creek, but you will have to turn around, especially in the summer you get to a point where you could literally walk across the stones and go from one side of the creek to the other. I’ve kayaked up that creek in August before and just did a u-turn at the end, went under the bridge and was back in the lake–all very easy. 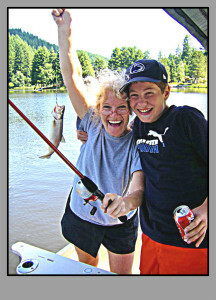 and catch and keep two cutthroat trout per day or catch some really good-sized steelhead or salmon to catch and release. I’ve watched families go to our little beach at the clubhouse and plunk a line in or fly-fish off the bank. Lures only please. 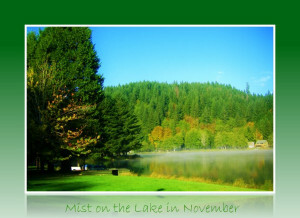 The season is from May to November. 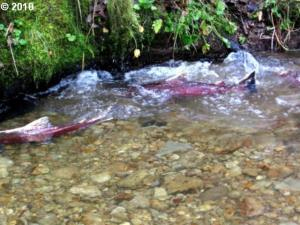 We also have a fish ladder and salmon that spawn in the fall/winter and early spring months every year. THAT is quite an event to watch! Some of the fish literally jump up the ladder, while others are cheek-to-jowl in the smaller creeks, sometimes so thick you could walk on them. It’s such a great experience to share with kids or kids at heart. 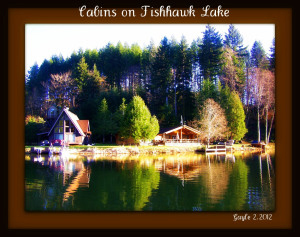 Fishhawk Lake is a best kept secret, hidden off the main highway and if these descriptions suit you or peak your interest, be sure and call me for a private tour of Fishhawk Lake, as I live here and work here as the fulltime “realtor on the lake”!